These kits are currently in stock, but most of this first batch is sold. The kit is made out of solid aluminum with PVC tanks and pipes like the original. It will even come with an aluminium stripper pole, just like the original set. It will also include a forex 3mm background graphic and it will come fully painted like you see in the picture. An expansion pack with larger floor plan is available separately. Excellent craftsmanship. The materials used are of very high quality and well worth the price. I have non collector friends raving about how awesome my dioramas look. The service corridor is special because this is where we first met Leia and R2D2 in the original trilogy. And to be able to recreate this moment in my own home is truly a wonderful feeling. I have had this piece in my home now over 2 months and I still sit and stare at it everyday. The item was easy to assemble thanks to Joost’s video and the addition of the tool in the kit. The service corridor looks amazing in my display. 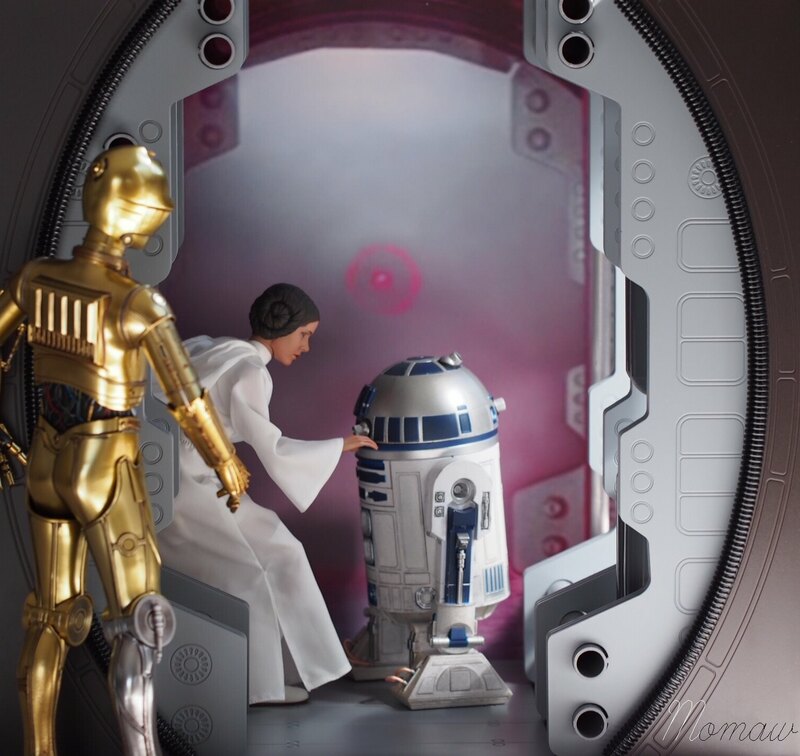 Truly a magnificent piece, seeing another collectors’ photos of this prompted me to purchase R2D2 and Leia just for this scene. So realistic, as already mentioned the craftsmanship involved is outstanding, materials are of such high quality, cannot recommend enough! Thanks for creating such amazing dioramas, even my wife approves! My first diorama and was I glad I got it. Great product and craftsmanship. It’s an amazing display option for R2, Leia, C3-PO and even Stormtroopers!!!!! I have two other projects on pre-order. If you love Star Wars then these dioramas will make a welcomed addition to your collection. Excellent customer service and communication. Don’t hesitate to buy!!!!!! This was the second diorama I purchased. The way the forced perspective was engineered was perfect for the Detolf. The box was really heavy and once you put it all together you see why. Solid quality aluminum and great paint apps. I loved the fact he included the background printed piece as well. The night I put it together and lit it up with some red puck lights, I sent a few pictures of the Hot Toys Leia and SSC R2D2 in the diorama to my friend. He couldn’t believe the quality! Another absolutely fantastic piece of creativity shared with the collecting world! This, like all Joost’ other diorama’s, is amazing. Quick and easy to assemble and fits perfectly inside a Detolf or Besta (with extension kit). Just imagine the price Hot Toys would charge fot this… At probably less then half the quality. To have someone like Joost in the community is nothing short of a blessing. Easy to assemble. Quality materials. Just like it jumped out of the movie! Brings these already amazing figures to life! Cant wait for more! Maybe my favorite diorama to date. Not the most iconic background of them all but certainly the most detailed creation from JazzInc and more importantly its most versatile. Not only will it work well with quite a few Star Wars figures (Princess Leia, R2, 3PO, Rebel troopers, Imperial troopers…) but could, in my opinion, also work with other licenses. From the top of my head, Terminator, Alien and why not Marvel or DC. Wonderfull work and great service. Love the small details. My leia and r2 are happy ? I’ve ordered all of JazzInc dioramas. A must in everyone’s collection! great piece, solid construction, great attention to detail well packaged for delivery. My most challenging one so far in my collection, to put together as a single person but with that being said? This is a fine looking piece!! I only wish I would have brought the lighted ceiling. Now, having a hard time deciding which one to order next? I’m eyeing the speeder, Falcon, and of course the emperors chamber!! Decision, Decision, Decision…Ugh!! We will start on our version of the One Six Scale Main Cargo Hold Millennium Falcon 1/6 Diorama for Ikea Besta/Stuva (so around 22 inches wide, and variable depth for Besta and Stuva, Height would be around 22 inches as well). It would work for scenes from A New Hope, The Force Awakens, Empire Strikes Back and more! The more I think about it, the more I want to make this modular, with floor pieces that fit together so you can expand. Several wall pieces and a separate bench seat so you could expand and arrange as fits your display space. Based on the very positive feedback for that idea, we will incorporate that in the design.